Do you like the idea of finding 'peace of mind' but struggle to meditate? Are you drawn to meditation but find it hard to actually DO? Then this page is for you. Maybe we could all be as calm as Buddha. That depends . . . on who you're asking. There is no universally accepted description for meditation. Each tradition/school/philosophy has it's own way of defining and practising it. From this we can conclude that 'There Are No Rules'. For an independent definition, free of religious bias, it's worth looking in a dictionary. My Chambers English gives this: Meditation v.i. to consider thoughtfully (with on, upon): to engage in contemplation, esp. religious - v.t. to consider deeply, reflect upon: to revolve in the mind: to intend. I thought it was to do with 'clearing the mind', stillness and silence? These are certainly the stated aims of many of the schools of meditation . . . but are they realistic in today's society? What we need to bear in mind is that most meditation practices originate in times were the pace of life was far slower and the way of life far more natural. Also many students of meditation would have been practising since they were infants. i.e. with minds conditioned to peaceful thoughts and an environment without many of today's pressures, the possibility of finding absolute peace of mind may have been realistic . . . to most westerners it's less likely to be obtainable! However, if we restate the aim slightly, we might still be able to achieve this 'clear mind': For example, to not get ATTACHED to thoughts is another way of pursuing the Buddhist aim. Here, it's OK if thoughts arise . . . but we 'let them go' . . . they just drift through our consciousness without us taking any real attention to them or getting caught up in them. Like a gently flowing stream . . . a LIVING still-ness as opposed to a dead calm: not only easier to achieve but, to me at least, more natural and conducive! So, what are other aims of meditation? Whatever YOU need each time you meditate! So, after a hard day at the office, the aim may be to 'switch off'. If you're struggling with a difficult situation in your life, the aim may be 'to rise above' it . . . and perhaps get some deeper insight into the situation. Not to 'still' or 'quieten' the mind? Yes and no! Yes, in that we DO aim to rise above the nagging, superficial, thoughts that often fill our day-to-day lives. We DO need to give ourselves a rest from worries and concerns of modern life. 'No' in that total stillness, besides being almost impossible for modern man, isn't necessarily helpful. Our minds need to process our thoughts and feelings! By rising above the day-to-day thoughts, we allow our mind to sift through deeper issues. Indeed, the aim of meditation may well be to give our mind a chance to 'catch up with itself'! Thus, if we have a question we're seeking clarification on (like 'should I change jobs?' or 'I'm tired of constantly arguing with X - what can I do about it? ', then meditation gives us chance to truly reflect on such matters . . . not to consciously think about it, but to tune into our higher wisdom . . . to tap into our intuition. From here we're far more likely to see the truth of a situation! 'Wisdom? Higher Truth? What do you mean? It's suggested that man uses only a small % of his brain for logical thought. Meditation helps us access the rest of our mental abilities - our intuition, our innate wisdom. What some would call our soul, our spirit, our inner or higher selves. That bit of us that is divine. Thus meditation is any technique that helps us connect with our 'still small voice of calm', our inner peace. In this deep place within us, we know what's really right or wrong with us and our lives. We have the answers to the things in life that are bothering us. What better use of meditation than to help us cope with life! But to meditate we're often taught to 'go within'? Yes, in that we want to connect to the peace and wisdom within us . . . but that doesn't mean disconnecting us from the normal world in which we live! To 'go within' is fine, to help us find some truth and peace . . . but not to escape from the world! We cannot run away for ever, so better to use our meditation to help us deal with our lives! So meditation is more of a healing? It can certainly be considered in that way. Many who practice Reiki (or some over form of healing) will say that their self-healing treatments equate to meditation and versa visa . . for both are means of connecting to our inner/higher self. By tuning into this part of us, our inherent healing processes are enabled. Another way of looking at it is that meditation is like praying - asking for God's help. In meditation we are closer to God. We rise above our conscious mind and become aware of the God within us . . . which many consider to be our inner / higher self. Since God is everything, knows everything, it seems reasonable that he/she/it will have the answers to our problems! If you feel you're gaining benefit from your meditation practice, then that doesn't matter, does it! If it does bother you, then you may need to reconsider what you mean by 'God'! You may find reading about and experiences religions other than the one you were brought up with of help . . in doing so you may also come across a prayer/meditation practice that you find more effective. In many schools of Meditation, yes. It's a natural and easy thing to focus on. 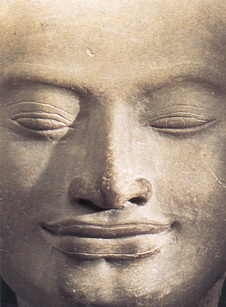 My partner at Pintados was taught to meditate by a Buddhist called Taravodjra: his technique was based on observing our breath . . . and what comes to mind in the process. We can then choose to focus on the thoughts that arise . . . or let them go. Where you're 'lead' on 'a journey'. i.e. a voice (live or on tape) talks you into a meditative state. The idea is to guide your mind into this higher, relaxed, state. These journeys might be a walk through a forest, your own mind, space; they might 'play' with colour, sound, your breathing, etc., etc! Obviously some of us are going to find we can relate to some of these guided meditations better that others! And it's not just the subject matter that will affect their effectiveness - the speed, volume and tone of the guided voice may all influence it one way or the other. It also helps to be in resonance with the person leading the visualisation! Is a Guided Meditation the same as a visualisation? I'd say 'yes', though some might disagree with me. Both terms cover a huge spread of actual experiences and whichever you do (or are told you're doing!) it's worth asking yourself what your intent for this particular session is . . . this will help your conscious mind go where it needs to go. I tend to see a visualisation as a way of triggering our imagination, of getting our creative, intuitive, inner self to make itself ‘felt’ . . . or 'seen' or 'heard' - a visualisation doesn't just work with the visual senses!. Our imaginations are very powerful, they have a huge potential in helping us explore our emotions, our innate wisdom. Often they can connect us to a truth and peace that our logical minds have no grasp of! If nothing else, Guided Meditation / visualisations help to restore some balance to our minds . . . and give our logical brain a rest! What about music? Or should we meditate in silence? Whatever feels right for you! Music can tigger our imagination, help our minds take a journey . . . and as such can be very helpful. If however the music just gets the logical brain thinking then you'll be better off without it! Another alternative which works well for many of us, is to meditate with natural sound - e.g. sitting the side of a stream or the sea, listening to the birds and rustling trees in a park or garden. These sounds assist us in gaining a meditational state because they're natural. They're constant, yet ever changing. They're a part of 'Life The Universe and Everything' - God's Creations - and thus help us to let go of our thoughts and allow our natural, universal, self to come to the surface. Should we have an object to meditate ON? As with music or nature, having an object as a focus for a meditation can be useful to give the mind something to take it away from its ramblings. Some however prefer to meditate with eyes closed . . . in which case any object has minimal use to trigger an internal focus (in the minds eye). There is no 'right' or 'wrong' object to use. Candles are traditionally suggested and are good in that the flame, like the wind or tides, reflects elemental forces . . . alive, ever changing, natural. We could also focus on the breath' - or on 'loving kindness' for example. What's perhaps more important than what we focus on is that we watch our reactions. Then you obviously needed to! Why fight it!? The meditative state connects us to the true, real, us. If this bit of us feels we need to rest through sleep, we're probably better off following its advice! Some of the things I'm saying here run counter to the established teachings on meditation. But if it rings true with you, then you owe it to yourself to follow this guidance. To Thyself Be True! Yes! To allow our real, whole, self to live in and through our conscious mind and body. We all benefit that way! Meditation connects us to our true, divine self . . . not so much as a surrender as a return home! The only things we're giving up are our doubts and fears and the other emotional attachments that stop us enjoying life! Although meditation has been seen as a 'switching off' (from the outside world) that's not really what it's about. Consider the Buddhist Monks - in their meditation practice, their Master will, at random, strike a large gong in their ear - if they flinch, they've not succeeded! In the true connected state we are aware of both our highest self (the divine) and the 'normal', material, world around us! We can thus see meditation, like healing, as an approach to help us bring 'heaven to earth'. Yes! When we're able to stay calm and content, as in a meditative state, within the world around us. OK, so when we first start meditation we may have a long way to go, but if we aim to 'connect to our true self' through our practice, rather than 'clear our mind' than we're more likely to 'find' our heaven on earth! By allowing your own ways of meditation to develop, to not be afraid to question your teacher and to follow your own path. - meditate while travelling on buses, trains and planes . . . and whilst waiting for public transport! If it (whatever you’re doing - or not doing!) helps you feel 'whole', 'real' and true to yourself, then you ARE meditating! . . . so don't let anybody else tell you otherwise!